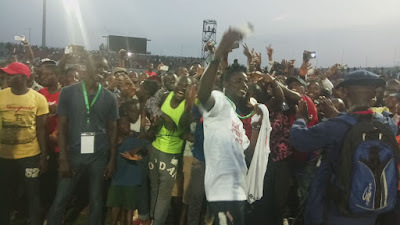 It was 12.30 am on Monday morning, a few hours after Enugu Rangers were confirmed as League Champions for the 2015/16 season and my phone rang inviting me for another party. Since the end of the game at about 6 pm on Sunday, the quiet town of Enugu transformed into on big noisy party ground. First there was a party at the Rangers FC club house where fans, the media, members of the supporters club and well-wishers turned up to celebrate the League title win. I was there for that one (because I was invited) alongside Queen John, Jessica Amadi, Nduka, Lekan Ige, Peter Abaje and Zazi Bariza amongst many other journalists we met there. As soon as we rounded up from that place, it was The Gates hotel as the leadership of the League Management Company wanted a “sit down” with members of the sporting media in Enugu and it was a time for people to actually get close to the likes of Nduka Irabor, Shehu Dikko, Salihu Abubakar and the rest of them and maybe share ideas or ask questions. But I needed to grab some shut eye after our time at The Gates so when that call came in at half past midnight, I knew I wouldn’t go out again. 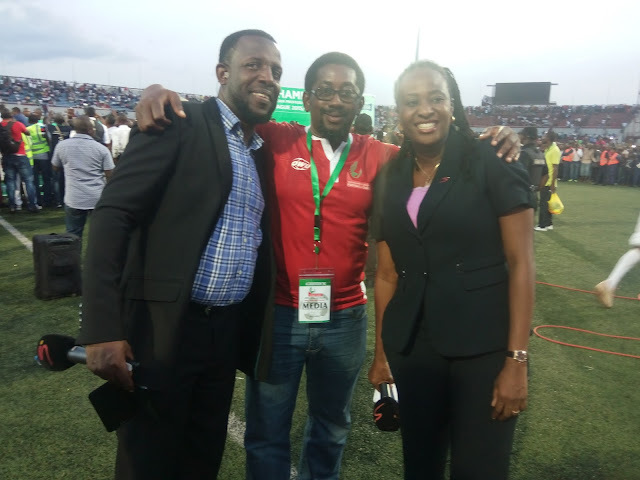 It was from Peter Abaje who told me Imama Amapakabo was out and wanted to hang out with us. It’s not like I take alcoholic beverages anyway, so what was the point staying awake all night? I declined and decided to get my shut eye rather. But the reason for the party was simple. 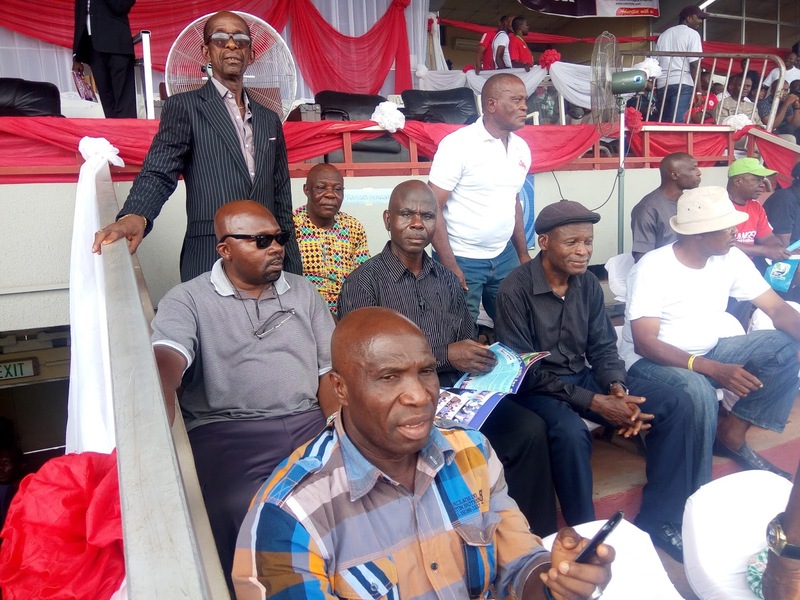 Enugu Rangers were champions of Nigerian football for the first time since 1984, a heavy thirty two years ago. One could just imagine the heart break by successive generations of Rangers teams that could not win the trophy after that team captained by Louis “Commander” Igwillo, who incidentally was at the stadium on the day. And the best way to wrap up a title in after so many ways would always be a mauling and the game ending 4-0 in favour of Rangers just showed the kind of team they had been all season. The football they played on the day was pleasing to the eyes. Heck… the football they played all season long was pleasing to the eyes. El-Kanemi was not a poor side, or bad playing side. Teams coached by Ladan Bosso have always been fine playing sides, right from his days at Wikki Tourists, but the occasion was just too big for them and they had no answers for Rangers, 4-0 being a fitting result. You will have to give it to the Rangers management who did a good job planning the game. Throwing the gates open was a mistake on the part of the governor, but it had been done and the crowd had to be managed. Did they manage the crowd well? Well, under the circumstances, they did their best. My estimates showed that the stadium was over full by maybe, ten thousand people which was a scary thing but there were no incidents. Thank goodness. At the end of the game, the fans even held their cool and did not encroach the pitch immediately like I expected they would have done. They actually formed a perimeter around the pitch and waited patiently for the trophy presentation before they ran in to felicitate with the players. That was expected, wasn’t it? There was a sector at the VIP section of the stadium cordoned off for ex Rangers players who needed to see their team win again. Of course there were lots of oldies who played for Rangers before my time and there is no way I would have recognized them. 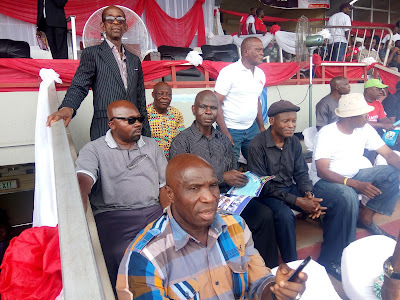 Heck, Davidson Owumi was there too. I was so sure those chaps would have been so elated to be honoured that way by the team. There was another part of the VIP section of the stadium cordoned off for families of the current Rangers team which showed great planning on the part of the club. A lot of European players complain that they are hardly focused on Cup final days because they expend a lot of energy trying get tickets for their family. If the players were relaxed knowing members of their family won’t have problems getting in then that was good planning. It will help when they play in the CAF Champions League next season. I had to be in Enugu. My first match day experience of the year was on match day 36 when Rangers played against Sunshine Stars and I enjoyed every bit of it. I wanted to see how the people prepared for the big match; I wanted to see how the club organized themselves for the day; I also wanted to see how they would celebrate the victory and these where the things I had in mind as I set of for Enugu on Saturday, October 1, 2016. First thing I did on arrival was to go to the stadium to get my accreditation tag and then take a walk around to understand what was going on in the ground as regards preparations for the big day. Three out of five people on the street were excited about what would happen the next day. Funny enough, one chap I met while having breakfast on the morning of the game disappointed me when he asked what game was about to happen at the Cathedral which was just a hundred meters from our hotel. Aside that annoying chap, the people of Enugu could not wait for match day to get it over with. Pre-game, I met up with Christian Chukwu who coached the team the last time they won the League in 1984. “O boy. Why won’t I be happy? You know how long we have waited for this?” Chukwu said and I let him go so I could continue my tour of the ground. 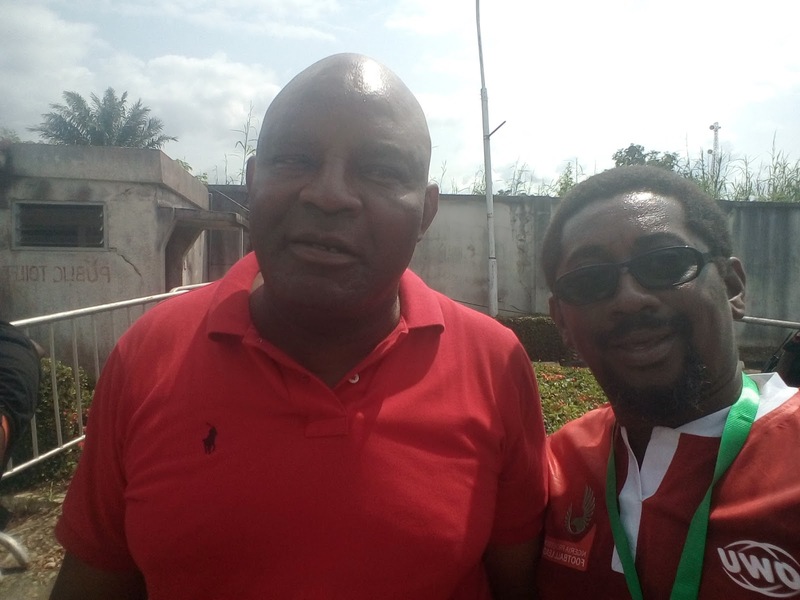 I also met with Davidson Owumi who also played for Rangers during their days in the wilderness and also was the club’s chairman, leading them to 2nd place on two occasions and the FA Cup final in 2004 and 2007 and he was obviously a very happy man too. I guessed that feeling could be common amongst ex Rangers players. The next day at the Stadium I met Louis Igwillo, Jude Agada, Okey Emordi and a few others who played for the team back in the day. 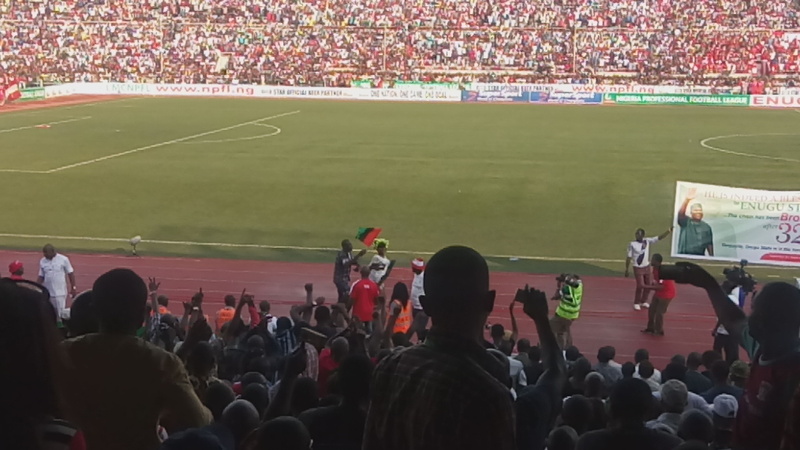 Needless to say, Enugu was one big happy town because the league trophy was returning after thirty two years. How those long cold years would have been frustrating for every fan of this great club, but here we were about to celebrate another title for the club. For the people of Enugu, the party will never end. 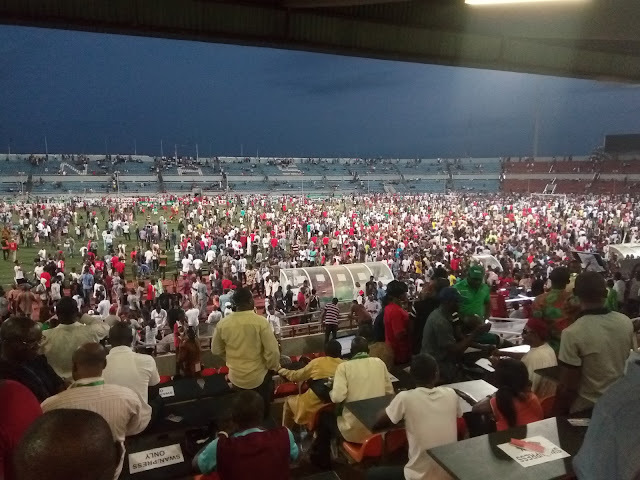 Anytime fans of Iwuanyanwu Nationale, Dolphins, Kano Pillars and Enyimba taunted them it was like an arrow piercing their hearts. Now they own the bragging rights which they will hold until the end of the 2016/17 League season. They will also take part in the Champions League which they hope to win. 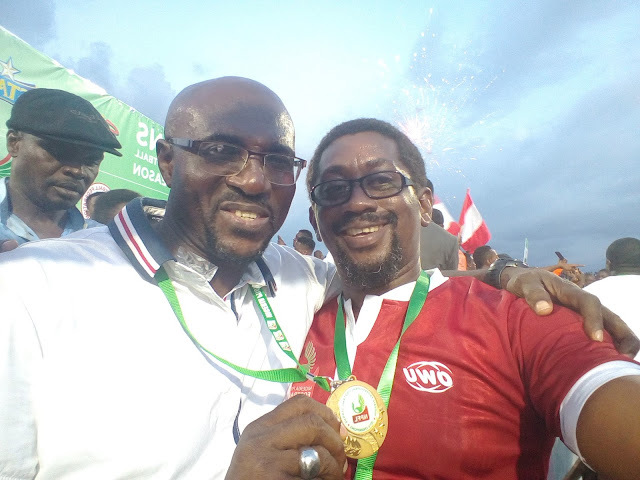 The party continues in Enugu… Maybe there will be a much bigger one at the end of next football season.